Intel and now Jelly Bean inside. The Android Jelly Bean update for the Motorola Razr i has started to roll out in the UK, bringing with it a host of new features and improvements. In a post on the Motorola blog yesterday, Motorola explained that the update will be phased, so don't panic if it hasn't turned up on your handset just yet. Some of the new features which the Jelly Bean upgrade will bring to the Motorola Razr i include Google Now, Voice Search, better notifications and the smoothness of Project Butter. 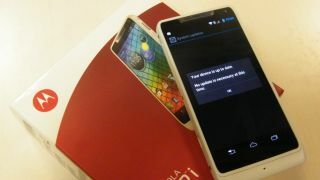 The Razr i is one of very few phones to sport an Intel processor, and even though it's a single core offering it manages to achieve some impressive speeds, helping the phone to a respectable four out of five stars in ourin-depth Motorola Razer i review. You'll be able to receive the Jelly Bean update over-the-air on the Razr i, so there's no need to dig out the USB cable and fire up the computer. If you're worried you may have missed the new software notification head over to Settings > About Phone > System Updates on the Razr i to check for Jelly Bean.